My first year at YouthBuild connected me to many opportunities, even beyond the job that I have now at at Grayboyes Commercial Window Company. The school helped me break out of my shell and learn to network. I learned from being at YouthBuild that if I didn’t try to prove myself or show what I was capable of, nobody would be able to see what I had to offer. YouthBuild is an alternative school for former high school dropouts who are motivated to do more. Thanks to YouthBuild and the opportunities they gave me, I went from having a dead-end job to now being at the very start of my dream career. My goal is to be a Journeyman in the glaziers’ union, and the company I work for is supporting and encouraging me to embark on that training process this year. I was a Green Building student at YouthBuild, which meant I was learning construction skills at a formerly abandoned house in North Philadelphia. 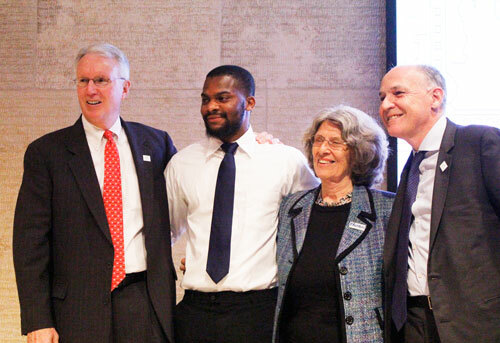 This is how I became part of the partnership between YouthBuild and Saint-Gobain. Saint-Gobain supplies YouthBuild with materials and support to renovate homes to be green and energy-efficient. At the same time, I was gaining confidence in myself. I learned how to network and communicate with other professionals, thanks to opportunities such as the GreenBuild conference in Philadelphia’s Convention Center, which we attended thanks to the Saint-Gobain partnership. That confidence has helped me get to where I am now. Additionally, being on the GreenBuild squad and working with experts from Saint-Gobain made me feel like I was part of the solutions to the problems in our community. A green house is one less thing for a community to worry about. There are a lot of abandoned houses, trash piles and littered sidewalks in Philadelphia. I think that kind of environment hides what Philly really is, and hurts the potential of what Philadelphia can be. It’s important for all of us to have beauty, nature, and sustainability in our neighborhoods. Green is better for our community, and for our economy. When I first dropped out of school, it was because I needed to support my family. Now, thanks to YouthBuild and Saint-Gobain, I am not only able to support my family, but also my community. We can’t do enormous things by ourselves, but we can achieve them together and by doing them one piece at a time. I am grateful to have had the opportunity to build a green house with Saint-Gobain. It gave me experiences that helped me transition from a low wage job into a rewarding career. It also gave me a chance to construct a better future for the next generation, and to show myself and others what I’m capable of contributing. Previous Post Vote for YouthBuild Philly to Win $25,000 in Neighborhood Assistance Funding! Next Post Building a Student Lounge with IKEA South Philadelphia!